The Surface Go is not a fast computer, but it’s familiar. That predictability is sort of a relief after using the iPad Pro and Pixel Slate, both of which have ambitions to replace your laptop but fall short of that goal because of their software (the iPad Pro is restricted, the Pixel Slate is buggy). And to be fair, the Surface Go does, too, but only because you have to be careful not to overtax it. I’ve been using the LTE version of the Surface Go for the past couple of weeks. I bought it myself, fully knowing what I was getting into — here’s my review of the regular, non-LTE version. If you’re unfamiliar with the Surface Go, you should read that — the LTE version is only different in a couple of ways that I’ll get into below. Basically: it’s a tiny Microsoft Surface that’s a little underpowered, but nevertheless could endear itself to you. Instead of doing all the usual review stuff here, I want to explain why I love this little machine, but wouldn’t recommend it to most people. There are a few reasons I love it and — just to be very clear at the outset — a few more reasons I don’t think it’s a smart buy. The Surface Go is not a fast computer. It won’t stop you from using it like it is — instead it will only slow down when you try to do too much. I would never go so far as to say that its limitations are features, but I have found that embracing those limitations instead of fighting them turns out to be a strangely calming exercise in self-restraint. Let’s set some context. There’s a ton of innovation and experimentation happening on computers, so much so that the word “computer” itself has become fraught. Semantics aside, it’s been a blast to watch big tech companies try to breathe some new life into big-screened computers — even though it hasn’t been a blast to use some of these early efforts. So what’s been happening with slates these past few months? Well, the iPad Pro has awe-inducing hardware, but software that can’t live up to it. The Pixel Slate has a few good ideas about how to bring phone software into the tablet and failed to execute any of them well. The Mac, well I don’t know that it fits in with this bunch, but it will eventually run some version of iOS apps, and that little experiment is not going super well, either. 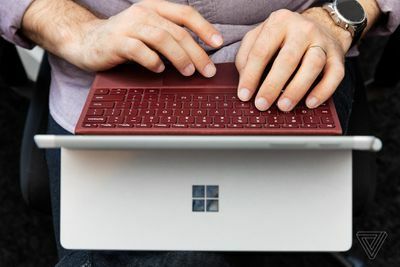 The Surface Go and Pro have similar ambitions, but it’s easier to forget about them because Microsoft has been pursuing them for so long (with mixed success). But most of all, it’s easy to forget about what the Surface is trying to do because you can always fall back to Good Ol’ Classic Windows apps whenever you need to. I think you can boil these ideas down to one simple thing: our computers should act a little more like our phones. 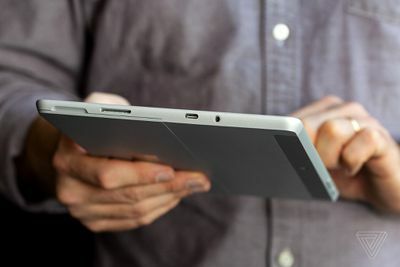 Create a device that can work seamlessly as either a tablet or a laptop, including a kickstand to make the basic ergonomics of hybrid devices less of a hassle. Create an interface that seamlessly switches between touch-friendly tablet and mouse-friendly laptop. Run a new, more mobile-inspired kind of app. Something that’s preferably downloaded from a store that can manage the security and updates of that app. Something that is able to work on different kinds of processors, at different screen sizes, and with touch or a mouse. Run a managed operating system (S-Mode) that will keep you from installing that one weird thing that screws up your browser, your registry, and lord knows what else. It would be updated and kept secure, without mucking about with version numbers or making you wait for features on a yearly cadence. But if you like, you can just switch over to a full mode that won’t stop you from doing whatever you want. Play nice with your phone, no matter what kind of logo is on the back of it. Insofar as your phone maker will let it, Microsoft wants you to be able to access your phone’s stuff on your Surface. Over time, Microsoft has gotten better at each of these goals. 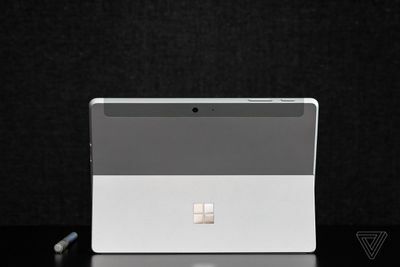 I’d say that Microsoft’s Surface and Windows efforts over the past decade have felt a little bit like Babe Ruth pointing to the stands, then whiffing the first swing, fouling the second pitch, then realizing that just getting on base is better than striking out. There are a lot of base hits with the Surface line, a couple doubles. The first Surface RT? Huge whiff. Windows 8, too. Microsoft’s efforts to innovate on apps and create a restricted S-Mode version of Windows 10 all started badly, but recovered (a bit). Time and again, the company has had a pretty clear idea of what its computers should be a few years from now, then tried to ship them right now. And honestly, it wasn’t until the last couple of years that its execution started to catch up to its ambition. It started hitting those doubles. You should never buy a computer because of what it is trying to be, you should only buy it if what it currently is lines up with your needs. The Surface slate lineup has gone from “wouldn’t it be cool if” to “this is pretty cool now.” It’s wild that it took a few years for Microsoft to figure out the difference, but it finally has. It’s possible to take the idea that your computer should act more like your phone too literally (hey there, iOS on the iPad! ), but I mean it a little differently. Maybe it’s better to say that your computer should feel a little bit more like your phone. The Surface Go with LTE feels more like my phone than I expected, and that’s partly why I love it. I’m mostly talking about its physicality, it feels like a phone because it’s small and portable and subtly rounded. Now, I have to admit that the software experience is not phone-like at all. It takes Windows Hello a few extra beats than it should to recognize you and log you in. It also doesn’t wake from sleep instantly and sometimes Windows still gets that sleep / hibernate thing wrong: it can drain just sitting in your bag. Windows is still Windows. And at least as I use them, the apps don’t often feel phone-like, either. I probably spend 70 percent of my time just using the apps with classic Windows UI and only 30 percent using touch-friendly apps that are designed the way Microsoft really wants them to be. It also means the keyboard is usually attached. The more modern apps work well in tablet mode, but a bunch still do not. Having access to desktop apps is genuinely useful! But when you’re in tablet mode and can’t see what you’re typing because the input field is blocked by the virtual keyboard, it’s genuinely annoying. Having Good Ol’ Windows to fall back on means that lots of developers (including Microsoft’s developers) haven’t had to fully commit to the new vision. I get it, though, because when Microsoft tried to make that sharp turn with Windows 8, it bombed. Even so, I suspect my ratio of old vs. new is pretty common. It’s one of the biggest failures of Microsoft’s “you can still go back” approach. Because we always go back. 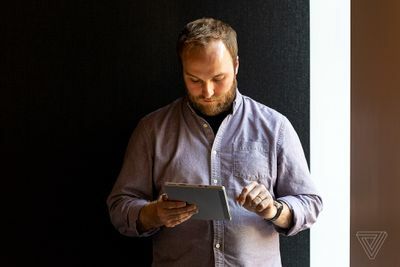 Microsoft needs to flip those percentages — and it needs to do it before Apple figures out how to make iOS less restrictive on the iPad. But back to the size of the Surface Go. It really is tiny and I really do carry it around more than my laptop. I have a little bag that fits the Surface Go (or an 11-inch iPad) and just enough stuff. It’s so much lighter and better than my regular laptop bag setup. I have said many, many times that I love small computers and it’s as true today as it was when the 12-inch Apple PowerBook appeared on Yao Ming’s lap in 2003. I love the Surface Go because it is so small. And yes, I say that fully admitting that the 10-inch screen is tiny and cramped and surrounded by silly-large bezels. That size has me leaning in closer to it. It’s the laptop equivalent of the hunched embrace you have with your phone every day. 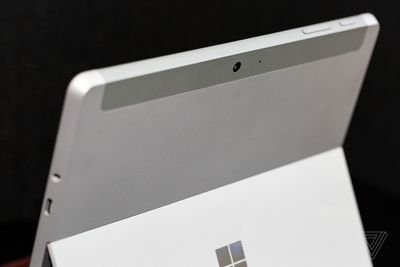 And doing that has a subtle emotional effect — the Surface go feels more intimate than other computers. It feels more personal, more mine, simply because it’s so small and close. That feeling of intimacy with a device matters, even though the way we talk about it has been tainted by too much marketing. There is something more human about the direct interaction of touching the screen, the ease of lolling out on a comfortable chair and holding the thing in a comfortable place. I often feel the same way about the 11-inch iPad Pro, but somehow the adjustability of the Surface Go makes it feel more personal than the iPad. The iPad Pro’s keyboard only works at two angles and the iPad Pro’s software just stops you cold when you want to do something. The Surface Go won’t stop you cold, but it will often make you wait. That’s how these things go, you can’t have everything. If you spring for one of the LTE models, the Surface Go and the iPad Pro also share another essential phone feature: they’re always online. The LTE version of Surface Go will run you $779 (that includes the basic black keyboard, which you’d be silly not to get). That’s $130 more than a similarly specced Go without LTE — plus whatever you’ll spend on data. Is it worth $130 to not have to faff around with turning on a mobile hotspot on your phone? Most people will logically say no, but for me the answer is Dear God, Yes. It’s one of those features that on paper you should reject every single time, but in practice is just really nice. You don’t have to think about having a connection, you don’t have to connect to potentially skeezy Wi-Fi just to grab your email, you don’t have to sit and stare at the settings on your phone and then stare at the settings on your computer to get online. It’s just always online, like your phone. For those of a certain age, it’s akin from moving from dial-up to DSL. It’s not necessarily faster, but you just stop thinking about whether you’re connected. You just are. It’s great, and Windows does a very good job of just falling back to LTE when you need it. I never want to buy another computer again without LTE. That day, sadly, is probably a long ways off. Beyond the fact that not enough people buy the LTE version to justify the cost of making it, I also have to assume there’s something mysteriously difficult about putting a Qualcomm modem in a computer with an Intel processor. My understanding is that it’s more of an engineering challenge than most people realize, and unfortunately I don’t think the Surface Go with LTE overcomes it. More specifically, I’ve experienced notably worse battery life on the Go with LTE than with the original. On the original I could get about six hours of active use so long as I took a little care to not overdo it. In the context of it being such a tiny machine, I thought (and think) that’s pretty good. But I have to be way more careful with the LTE version to hit that number — and usually don’t. Measured by active use, it’s a five-hour computer at best. My work requires me to run battery-killers like Slack, so I usually got less. Weirdly, I find the battery life number much more damning on a model with LTE. Because it has LTE built in, you’re going to want to use it away from Wi-Fi more often. And being away from Wi-Fi means being away from power. And that means that the battery life disappoints. The entire first week I spent using the Surface Go full time (both this one and the original), I spent an inordinate amount of time looking at the Task Manager and obsessing over what was eating up processor cycles and RAM. 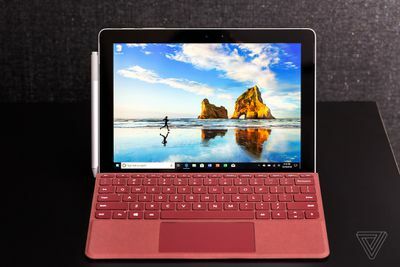 Both are in short supply on the Surface Go (the LTE model has the same Pentium Gold processor as the Wi-Fi-only version and is only available with 8GB of RAM and 128GB of storage), and you can drive yourself batty trying to min-max your apps to get things to go faster. This app uses Electron and is Bad, but that app does it in an Edge instance and is Good. This app can edit photos, but really chugs unless I close some of those other apps. This browser is fast and that one is slow. This app is one of the newer modern Windows Store apps and so will probably work better than that other one. This app always runs in the background and you need to hunt down a setting so you know it’s not draining resources when you’re not actually using it. And on and on and on. This is not what most people want to sign up for and it’s very much one of the strengths of the iPad Pro — it never makes you worry about that kind of stuff. But then, I can actually edit Google Docs and move windows around on the Surface Go. So, again, tradeoffs. After that first week, a funny thing started happening. I figured out a pretty decent setup somewhere in there and I stopped opening the Task Manager. I just sort of intuitively knew what the machine could and couldn’t do and if I over-reached, it told me so by slowing down. Watching your computer chug is not fun, but it did serve as a forcing function. I found myself using the computer differently. I opened Tweetdeck less, I limited myself to fewer tabs, I left some apps closed that I used to just happily have going all the time on other computers. iOS basically does this for you — it closes stuff in the background, it limits what apps can do when they’re not on-screen (and, sadly, limits them a little too much when they are on-screen). With the Surface Go, that cognitive load fell to me. But it wasn’t long before I could do it by feel, I just sort of intuitively knew when the machine was about to redline and pulled back on the throttle before that happened. All of which means that I found a kind of peace when using a slightly slower computer because it forced me to be a slightly more deliberate computer user. It’s not exactly the healthy digital balance that everybody’s been striving for this past year since we all started talking about Time Well Spent, but it’s something. Again, I am not trying to claim that slowness is a feature! It’s just that there’s something satisfying about knowing a tool’s uses and limits and adjusting your work to remain within them. The Surface Go should not be your only computer. When I use it, I often have to leave some work for when I will be back at my desk at a “real” computer. Instead of being frustrated by that, I simply choose to do some other work instead. Or — get this — I close it and put it in my bag and do something that doesn’t involve a screen. A few years ago, my wife and I rented one of those super tiny Fiat 500 cars while on vacation. It was cute and fun to drive, but its wee little engine struggled really hard to maintain speed when heading uphill. We didn’t get mad at it for what it couldn’t do. We knew the tradeoffs. Miniature cars have miniature power, and instead of cursing it, we cheered it on. You can do it, little guy, you can make it to the top of this darn hill. It’s going to take longer and those real cars are going to whiz by us, but when we arrive in the town we’re heading to we’ll be able to find a parking spot right away. 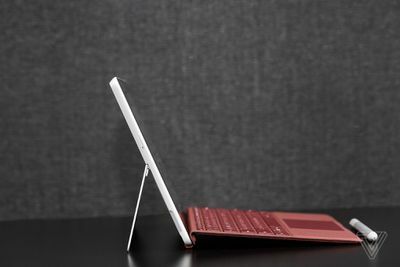 The Surface Go is like that. It’s wildly convenient, but really underpowered. Most of the time, you will just tootle around town with it, doing really simple things. Point A to Point B. Email and Spotify and browsing the web. That is the kind of stuff you should do with the Surface Go, and with LTE, you can do it anywhere. But when you really need to, you can load up Photoshop or 30 tabs or whatever your power-user computer thing is. When you do, it’ll chug. The trick isn’t to get mad at it, but to cheer it on. You can do it, little guy.